pyr8queen got up early and went for a walk through Lytchett-Matravers. 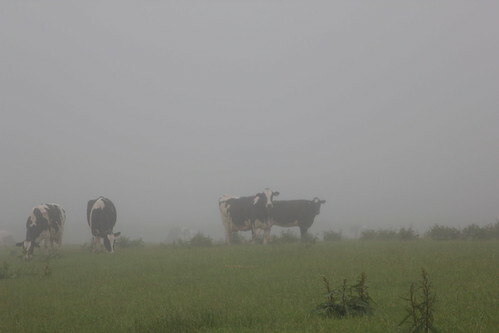 The mist was still on the fields, the animals were looking quite loverly - but I was quite tired. I'd resorted to using the UK equivalent of Nyquil to get some sleep, which is called Night Nurse. I say "equivalent" but that's hardly fair. It's equivalent in the same sense that a punch from Bruce Lee is like a slap from Pee Wee Herman. Sure, they're both humans hitting you, but good lord, there's a world of difference; if Nyquil is a sledgehammer, Night Nurse is a steam-hammer. So I was groggy and in need of coffee. Despite the awful things I'd heard about coffee in England, I must say I was able to find some decent coffee nearly everywhere, though obviously tea was still most prevalent. 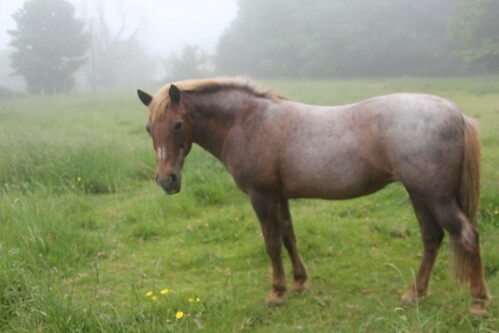 So I was soaking up some caffeine while she was jaunting through the misty morning fields. I confess I was also feeling more than a little homesick at this point. Mostly because of Blink, the greatest dog in the world, who I missed ridiculously and kept saying things like, "I bet Blink would like this." Anyway, a funny thing happened at the Dorset train station. Buying our ticket to Waterloo Station, I asked for two tickets. The attendant, a bluff and hearty middle-aged man who looked like he'd been called up from central-casting to be an English train attendant, asked "Single?" I was a little baffled, and stammered out, "No...uh, married. In fact we're on our honeymoon!" He laughed with a deep sincerity and said, "No sir, I meant - single or return?" He kept laughing and said, "Oh, that is funny. Can't wait till I tell the lads!" I'm sure he and his fellow ticket-takers had a good chuckle, but it was all very good-natured, and not at all spiteful. Our single tickets obtained, we hopped the next train in. I watched the countryside scroll by like a platformer video game - first we were in the beginner's country level, then the environment got more cluttered as we rolled through the intermediate suburban levels. At last the expert level of city environments painted a grim palette of grays and brick reds; when we at last faced the boss level in the train station. Which involved strange regulations on how we could carry our luggage, how we could get a taxi, etc. We checked in to our rooms at The Wellington, which was a sort of down-market student housing type arrangement. It met our needs, however, and was about the only thing we could afford given the abominable exchange rate and already exorbitant prices in London. Besides. Wellington! 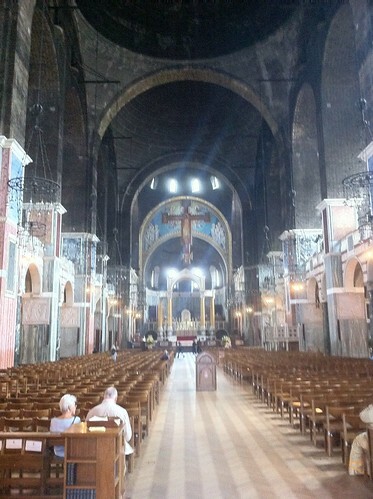 Still having a while to go before meeting pyr8queen's friend who was teaching in the city for dinner, we went to the Westminster Cathedral. At one point it was the tallest structure in the world - in fact, for thousands of years the Great Pyramids were the tallest buildings on earth, until Westminster. The interior was soot-stained but quite beautiful. We paid a little extra to ride a lift to the top of the tower and take a gander at London. I took a panoramic photo, but for whatever reason it's not really formatted correctly. 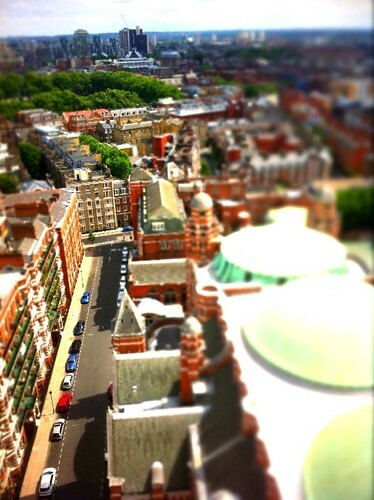 However, this little tilt-shift picture is pretty neat! That's a photo of the actual city, modified to look tiny. We hoofed around London in the area where we were staying, poking our heads in little shops and pubs. I was looking very much forward to a traditional pie-mash-and-liquor at an authentic London pie-shop, but never did find it! Now I'm craving meat pie again! 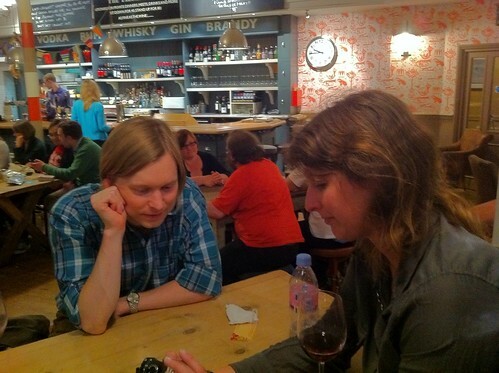 We did stop just off Trafalgar Square at a somewhat fancy-ish restaurant with a Scottish theme called Albannach. It had a modern decor by way of Highland elegance, and a menu that was au courant takes on traditional dishes. I had a really excellent fish-and-chips, best I've ever had, and a nice crisp cider. The service was atrocious, however, which was significant enough that I noted it down in my little field notes journal. 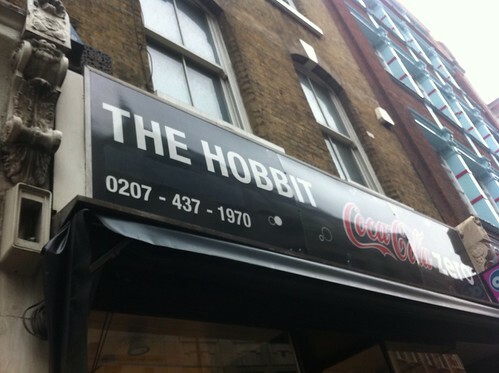 In our wanderings we saw this little shop, obviously the greatest place in the world. It's been in the news recently because, despite being open for over 20 years, the Saul Zaentz company sued them due to the soon to be released Hobbit movie. Ian McKellan (among others) paid for the legal defense, and as far as I know it's still open. I think I bought a lighter there or something, just to say I had. Eventually we met up with pyr8queen's college friend Wood, an assistant professor in London. He was buried in grading final papers, but had time to meet us for a drunken dinner. We started with drinks at a place called the Phoenix House. Eventually we went to a Sri Lankan restaurant called Sekara for dinner, where we drunkenly ordered way more food than we could really manage to eat. I had mutton lamprais, because you can't go to England and not have mutton! We got a bottle of wine as well as a couple of rounds of drink, and then returned to the Phoenix for more. All walking distance, thank god - and pyr8queen and Wood caught up after years. It was a convivial evening, indeed, after which we stumbled back to the Wellington and to sleep. I'm glad I'm not the only one who starts missing their dog while on vacation!